"All in one" : measurement, control and application. Has an electronically controlled vaporizer system. Has onboard gas monitoring for : Volatile Anesthetic and CO2. 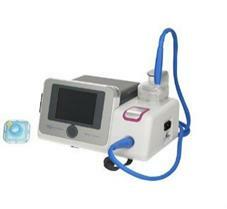 Automatically controls patient dose (etVA/MAC) on target. Can be combined with standard CC ventilators. Works with different kinds of ventilators. mySDSlot for communication and updates. Allows connection to patient data management system (PDMS). Is easy to loop-in into a breathing system. Has onboard H2O/heat reflector for proper climatization. Low amount of expired Volatile Anesthetic (loss) due to reflection. Expired Volatile Anesthetic is scavenged at the ventilator’s expiratory port. System automatically stops Volatile Anesthetic delivery at disconnection.